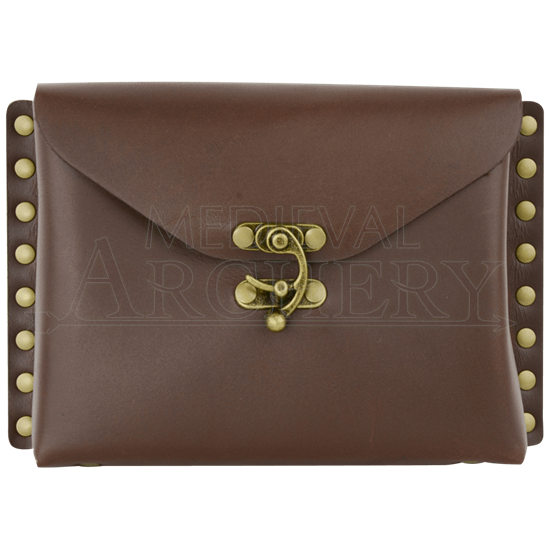 Whether you need a way to protect your writings or are in need of camouflage for your modern amenities while enjoying a Renaissance faire or costume event, this Leather Journal Pouch will keep your belongings contained and concealed. Hand crafted in our shop from 5/6 ounce chrome tanned leather, this sturdy pouch is finished with antique brass hardware. Available in black or brown leather, the pouch closes with a swing bag clasp. The two large belt loops on the back of the pouch will fit just about any size belt. Sized to fit any of our 5x7 journals, this leather pouch could instead be used to hold your keys, wallet, cellphone, or other items. The Leather Journal Pouch does not come with a journal, so be sure to browse our wide selection of notebooks and journals to find your favorite.